BOSTON – Book of Job, meet the Book of Knox. 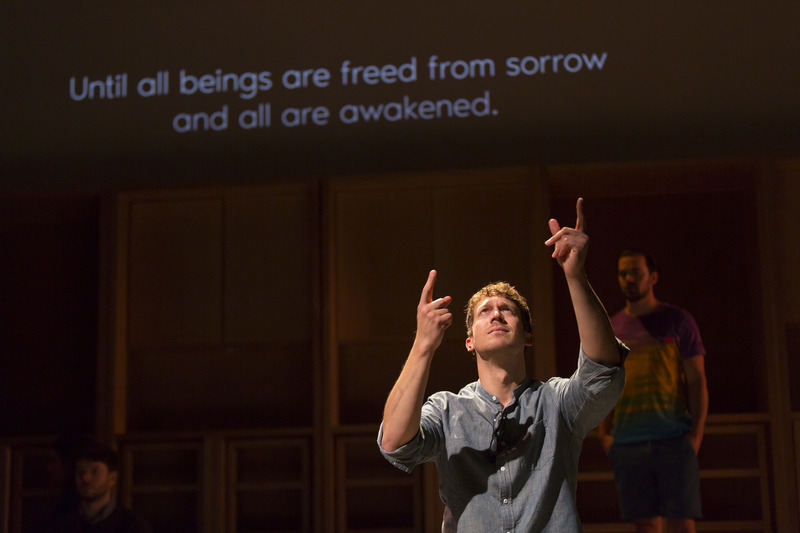 The issue of faith in the face of overwhelming despair is at the center of Craig Lucas’ “I Was Most Alive With You,” now having its world premiere under the auspices of the Huntington Theatre Company at the Calderwood Pavilion of the Boston Center for the Arts. The family at the center of the piece is bedeviled by all manner of afflictions, much like Job in the Bible’s Book of Job, and the frequent Biblical quotations are part of a strong spiritual component in Lucas’ piece. There are far-reaching discussions of religion and faith, especially given the events that will continuously rock the foundations of the family and family members’ individual relationships. Writer Lucas himself came on board to direct and he has engaged an excellent cast. Problems arise, though, when he veers off in several different tangents, diffusing his central message. Through his characters, he also wanders knee-deep into issues that are controversial in the deaf community, including whether parents of deaf children should learn to sign or teach their children to speak using lip reading, and the use of cochlear implants by the deaf. The humor in the piece is as dark as the suffering of virtually all the characters, with every ray of light met with a corresponding dark cloud. Nancy E. Carroll is Carla, the matriarch of the Southern California clan whose announcement that her cancer has returned and her finances have collapsed are like twin bombs dropped on the family at a Thanksgivng dinner in 2010. Son Ash (Steven Goldstein) has had his long-running battle with drugs and booze but is gamely hanging onto his hard-won sobriety even as he counsels his deaf son Knox (an excellent Russell Harvard), who is also working to stay sober after having his own issues with drugs and alcohol. Ash’s wife Pleasant (Dee Nelson) – irony assumed in her name – has her own long-running battle wikth booze but feels left out of the conversation for the most part, as part of a marriage that is hanging by a theard. Knox is involved in a relationship with a deaf gay man named Farhad (Tad Cooley), who has a harrowing life backstory and has recently relapsed in his battle against addiction. Astrid (Marianna Bassham) is Ash’s longtime TV writing partner and perhaps, ultimately, much more than that, and also regarded as a member of the family. Deaf and hearing-impaired actors have been infrequent visitors to the Boston stage in such productions as “Children of a Lesser God,” Deaf West Theatre’s acclaimed production of “Big River” which stopped at the Wang Theatre, and Speakeasy Stage’s more recent production of “Tribes,” but this is easily the most far-reaching attempt to make a theatrical piece completely accessible to all. 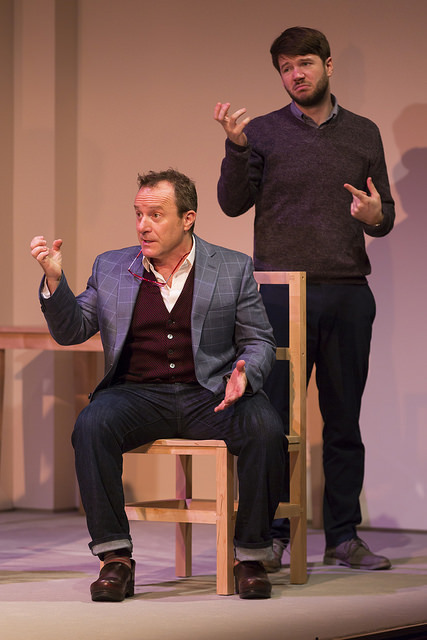 Given the important part deaf characters and issues play in the piece, the Huntington is all in in making the play as enriching as possible for all, using a variety of techniques. As part of the the rehearsal process, hearing actors learned American Sign Language (ASL) in workshops. In the program, the Huntington notes that “the level of stimulation may initially be overwhelming” for those theater-goers new to ASL, and suggests techniques that will help. While cast members are performing, shadow interpreters Joey Caverly, Amelia Hensley, Monique Holt and Christoper Robinson are performing and acting out the roles of the actors and actresses alongside them while expressing the dialogue in ASL Caverly performed in the Speakeasy Stage production of “Tribes,” earning an IRNE Award nomination. When the characters are conversing in ASL, the dialogue is also being projected above the stage, so no one in the audience is excluded when any character is speaking. While the overall effect and accessibility is both an impressive technical and theatrical achievement, the pain being visited on his characters by Lucas is overwhelming at times. Indeed, the travails that befall both Knox and Gameela Wright as Marianna, Carla’s nurse, almost seem to be comic overkill. But in the midst of their aforementioned suffering, the resiliency of the characters offers hope, even for those who find it hard to see any hope. Lucas should be able to convey his point and make the connection to Job without the seemingly endless stream of tragic events which – because of their repetitive nature and eventual gruesomeness – threaten the integrity of the entire piece. If he can do that, the piece may speak even more eloquently to both the hearing and non-hearing communities. The Huntington Theatre Company production of Craig Lucas’ “I Was Most Alive With You.” Directed by Craig Lucas. At the Calderwood Pavilion of the Boston Center for the Arts through June 26. huntingtontheatre.org.